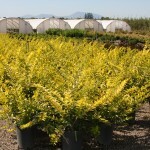 A fast growing shrub with bright yellow foliage. Blooms with clusters of fragrant white flowers in late spring. Colors best in full sun. It is tolerant of many soils as long as they are well-drained. It can be evergreen in warmer winters. 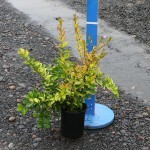 Useful as an informal or formal hedge, screening or in the shrub border.